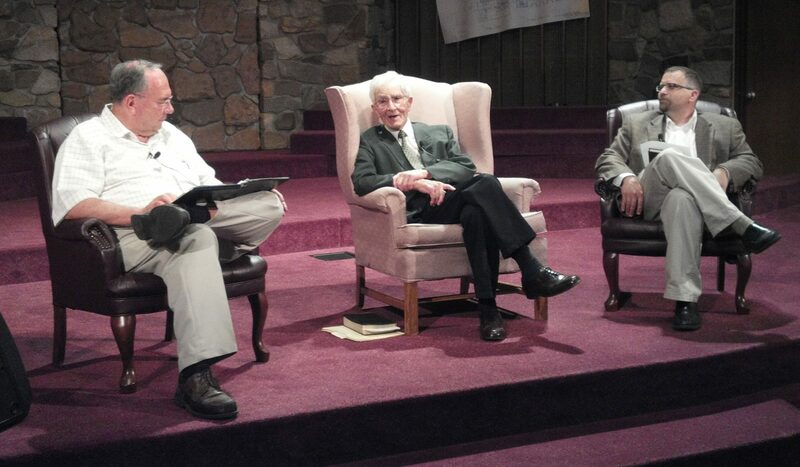 Dr. Robert Culver was interviewed by Dr. Terry White, left, and Dr. Jared Burkholder, right, on Sunday evening at Winona Lake (Ind.) Grace Brethren Church. Dr. Robert D. Culver, the last remaining person who attended the celebrated prayer meeting in J. C. Beal’s home in Ashland, Ohio, that led directly to the founding of Grace Theological Seminary, recently spent a weekend in Winona Lake, Indiana, speaking and sharing his memories. Culver, 97, drove with his wife, Celeste, from their home in southeastern Minnesota. He began the June 21-23, 2013, weekend with a meeting of Grace Seminary alumni and friends at which he shared observations of the state of the world in 1937, his personal memories of being a Grace Seminary student and 1942 graduate, and his memories of the early days of the seminary and of the Fellowship of Grace Brethren Churches. He also spoke briefly in each of the morning worship services of the Winona Lake (Ind.) Grace Brethren Church (Bruce Barlow, lead pastor), he taught an adult Bible fellowship hour at the church, and he was interviewed at length in the Sunday Night Praise service at WLGBC, as well. Dr. Culver, who was a brother-in-law to Herman Hoyt, was one of only several Ashland College and Seminary students who were present at the several meetings in J. C. Beal’s home after Alva J.McClain and Herman A. Hoyt had been separated from the Ashland faculty. He recounted the resolve of those gathered, and particularly noted how L. S. Bauman, pastor of the large Long Beach Grace Brethren Church, wrote a personal check to help start the funding for the new seminary. For two years the seminary met in the facilities of the Ellett Grace Brethren Church in Akron, Ohio, and then in 1939 moved to Winona Lake, Ind., at the invitation of Dr. W. E. Biederwolf, director of the Winona Lake Bible Conference. The seminary students met in the Mount Memorial building and utilized the 6,000-volume library of the Winona Lake School of Theology, which met only in the summers. The first graduating class of the seminary had only three students—Kenneth B. Ashman, Robert E. A. Miller, and Russell Williams. Culver eventually joined the Grace Seminary faculty, teaching Old Testament, Hebrew, and Theology from March of 1945 until May of 1951. He went on to teach at Wheaton College and Graduate School, Trinity Evangelical Divinity School, and the Near-East School of Archaeology at Jerusalem. Culver has written a number of books, including a 1,250-page systematic theology text, Systematic Theology: Biblical and Historical, which was published in 2005.